Heathrow airport is 15 miles from the centre of London in the London Borough of Hillingdon, inside the M25 motorway ring. Along with London Luton, Stansted, Gatwick and London City, Heathrow airport is one of the five airports in London. It is the seat of British Airways and Virgin Atlantic Airways. On an area of 1600 ha and with a total of 67 million passengers, Heathrow airport has the greatest number of passengers in Europe ahead of Paris Airport Charles de Gaulle. It comes after Atlanta and Chicago as the third largest airport in the world. Heathrow airport also has the largest international passenger number of all airports. In 1987, the British government privatised the airport operator British Airports Authority (now called BAA plc). Along with Heathrow, six other UK airports (Gatwick, Stansted, Southampton, Glasgow, Aberdeen and Edinburgh) now also belong to BAA. Heathrow airport consists of 5 Terminals. 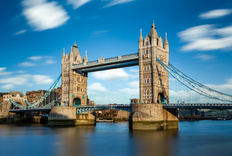 Flights from London-Heathrow serve a number of domestic airports such as Manchester and Newcastle, as well as popular long-haul destinations, for instance Bangkok and New York. One of the top destinations from London-Heathrow is Paris with flights from Heathrow to Paris operated by Air France and British Airways.